A confession fifty years in the making puts everyone’s favorite Paris détéctive très chic, Aimée Leduc, on a collision course with the “Hand,” a cabal of corrupt Parisian cops among who masterminded her father's murder—and among whose ranks he might have once found membership. When a friend’s child is kidnapped while wearing her daughter’s hoodie, Aimée realizes that the case has crossed into the realm of the personal in more ways than one. A dying man drags his oxygen machine into the office of Éric Besson, a lawyer in Paris’s 13th arrondissement. The old man, an accountant, is carrying a dilapidated notebook full of meticulous investment records. For decades, he has been helping a cadre of dirty cops launder stolen money. The notebook contains his full confession—he’s waited 50 years to make it, and now it can’t wait another day. He is adamant that Besson get the notebook into the hands of La Proc, Paris’s chief prosecuting attorney, so the corruption can finally be brought to light. But en route to La Proc, Besson’s courier—his assistant and nephew—is murdered, and the notebook disappears. Grief-stricken Éric Besson tries to hire private investigator Aimée Leduc to find the notebook, but she is reluctant to get involved. Her father was a cop and was murdered by the same dirty syndicate the notebook implicates. She’s not sure which she’s more afraid of, the dangerous men who would kill for the notebook or the idea that her father’s name might be among the dirty cops listed within it. Ultimately that’s the reason she must take the case, which leads her across the Left Bank, from the Cambodian enclave of Khmer Rouge refugees to the ancient royal tapestry factories to the modern art galleries. "Even after 17 books, Ms. Black has intriguing corners of Paris to reveal—from an enclave of ateliers once home to the likes of Gauguin and Rodin to a crime-ridden neighborhood where 'no one wanted to be witnessed witnessing.'" "One of [Black's] strongest mysteries . . . But the real joy of Murder on the Left Bank is in its familiar cast and its thoughtful, witty, occasionally melancholy evocation of Paris, the city where we keep so many of our most beautiful ideas about what life might mean." "Cara Black’s Aimée Leduc is a gem: a stylish, brave private detective (and new mom) who zips around Paris on a scooter . . . Black treats us to another of her beguiling tours of some of Paris’ little-known corners." "Marvelous . . . 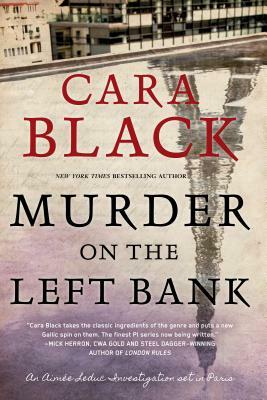 Murder on the Left Bank boasts all of Black's trademark charms, including deft plotting, sharp dialog and colorful sights and sounds." "Since 1998’s Murder in the Marais, I have looked forward to each new installment of Cara Black’s series featuring Paris-based private investigator Aimée Leduc. I’ve read them all, and there isn’t a clinker in the lot." "The atmospheric stories are so well-written that they make the reader believe they are in Paris." "Cara Black takes the classic ingredients of the genre and puts a new Gallic spin on them. The finest PI series now being written." "Gratifyingly full of local Parisian color." "A thrilling adventure, filled with colorful characters that will keep you turning the pages until the exciting finale." "Black's plotting is intense and acutely paced, with twists in each chapter and a smooth and powerful narrative that sweeps through the book."